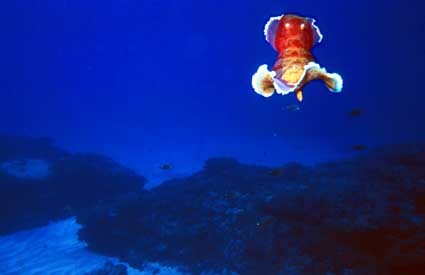 This is one of the largest nudibranchs, reaching 25cm (10 inches). The common name "Spanish Dancer" is derived from the flamboyant display of colour when swimming. They live in shallow water and can be found on intertidal reef platforms or washed up on beaches. H. sanguineus feeds on sponges particularly the encrusting varieties that are to be found in crevices and holes in the reef flat. Twenty species names exist for, what may eventually be only one or several species. Hexabranchus imperialis Kent, 1897 and Hexabranchus flammulatus (Quoy and Gaimard, 1832) are two well known synonyms. This specimen was photographed during the 1987 Lord Howe Island Marine Fauna Survey conducted by Neville Coleman. Photographic equipment: Nikonos lV-A, 35mm lens and Aqua-Sea Strobe. Image digitially enhanced. Coleman, N. 1989. Nudibranchs of the South Pacific 7-8. Francis, M. P. 1980. Habitat, food and reprductive activity of the nudibranch Hexabranchus sanguineus on Tongatapa Island, Tonga. Veliger 22: 252-258. Thompson, T.E. 1972. Observations on Hexabranchus sanguineus from the Australian Great Barrier Reef (Gastropoda: Nudibranchia). Veliger 15 1-5. Wells, F.E. & Bryce, C.W. 1993. Sea Slugs of Western Australia 93-94. Willan, R.C. & Coleman, N. 1984. Nudibranchs of Australasia 10 -11.